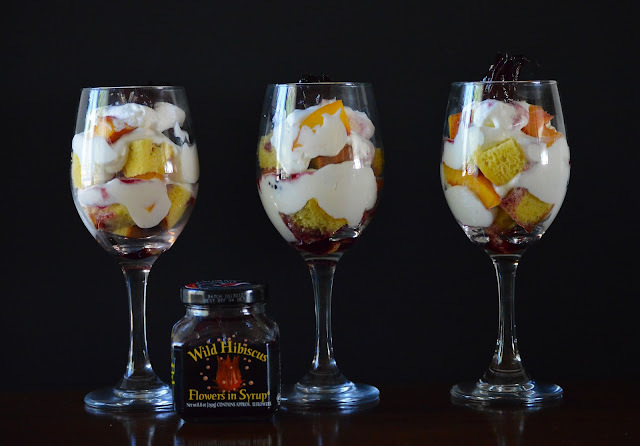 Typically when one thinks of English Trifle, they think of a heavy dessert loaded with custard, liquor, fruit and cake. As much as I LOVE the original version, I thought I'd lighten it up a bit to accent the unique flavor of the hibiscus syrup. The syrup almost tastes like a black raspberry - sweet but slightly tart. A beautiful combination. Wild Hibiscus Flowers in Syrup are not only beautiful, but taste great. I used pound cake to absorb the syrup and keep the white chocolate 'mousse' pure. I wanted definite layers to be seen in this dessert. Any seasonal fruit will be great with this. I chose peaches and blackberries being the end of summer and like the color and flavor contrasts. In a large, chilled glass mixing bowl, whip the cream until firm peaks form. In another bowl, add pudding and cold milk and whisk until thoroughly blended. Place in refrigerator to set for one hour. After the pudding has set, create the mousse by folding in all but 1/2 cup of the whipped cream. Dice cake into 1/2 inch cubes. 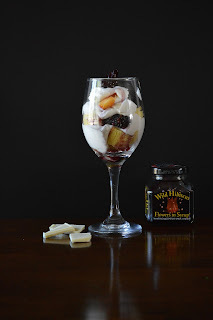 Using wine glasses or individual dessert cups, layer 3 cubes of cake, drizzle with 1 teaspoon Wild Hibiscus Flowers in Syrup, top with 2 Tablespoons of of the mousse and a few berries and peaches. Repeat the process. 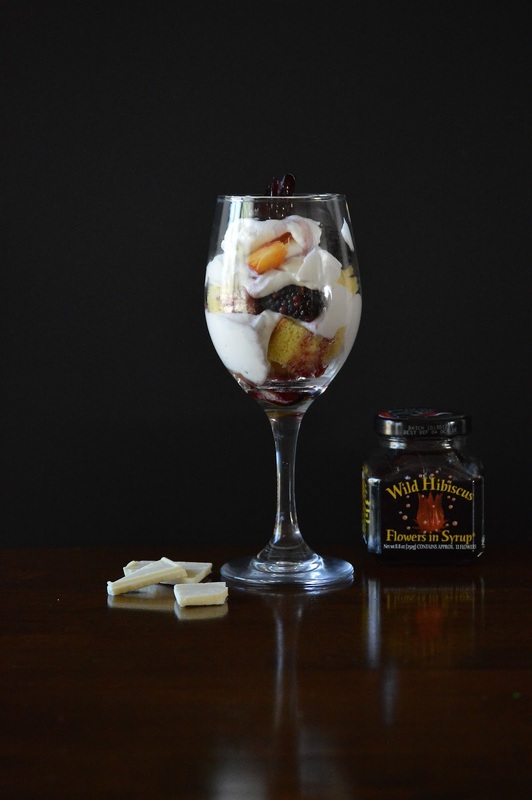 Top each dessert with a dollop of the remaining whipped cream and a Wild Hibiscus Flower. Chill for at least one hour before serving. Serve chilled. NOTE: You can use whatever fruit is in season. I used blackberries to offset the sweetness of the Hibiscus syrup. Other great alternatives include: Strawberries, nectarines, raspberries, cherries, and kiwi.